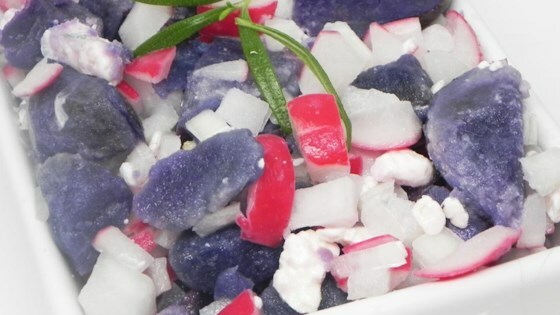 "You'll be the star of the party with this yummy, crunchy potato salad that's perfect for any Fourth of July celebration." Bring a large pot of salted water to a boil; add potatoes and cook until tender, about 15 minutes. Drain, cool and dice the potatoes. Combine the potatoes, radishes, onion, blue cheese and mayonnaise in a large bowl; mix until the mayonnaise evenly coats the ingredients. I had success with this recipe but omitted the vinegar and added 1/4 cup of sour cream - Delish!